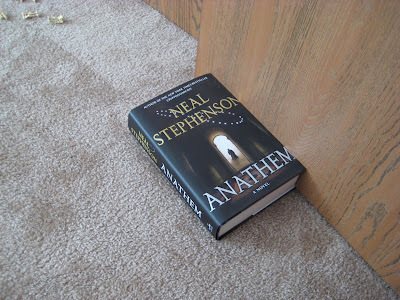 Here is a photo of my new $29.95 doorstop. It works out well because the extra weight of the cumbersomeness helps on breezy days. I was using it as a paper weight, but the book kept taking my simple English sentences and adding random letters and gibberish. No one has ever accused me of being smart, but I was able to make it through Donaldson and Tolkien without plucking my eyeballs out. (Well, not The Silmarillion, so maybe you can do the math.) It’s one thing to need a glossary to decipher a book. It’s another to need to have scratch paper, the entire works of Thelenes and an abacus. I guess I’ll just re-read Diamond Age again and remember the good days. Snow Crash was plenty deep for me. Lots of computers and drugs and exotic weaponry, just skim the vast swaths on Babylonian mythology and you're golden. I meant Sumerian mythology, see I told you I skimmed those parts.